The Central Media Office of Hizb ut Tahrir launched a widespread campaign to shed light on the reality of the conflict between China and the Muslims in East Turkestan who have been subjected to campaigns of Chinese massacres since 1863. More than one million Uyghur Muslims died in the clashes that took place in the year 1949 when the Chinese Communist regime led by Mao Zedong took over and abolished the independence of the territory, and annexed it to the Republic of China.The region was emptied of its population of Muslims who were distributed to the inner provinces in China. But Uyghur Muslims (of strong resolve) did not surrender to the Chinese; they erupted in revolution in 1933 and 1944, and the uprisings continue in the region against the uprisings Chinese occupation as was the case in 2009. Islam is the main reason for the intense hatred of the Chinese towards the Uyghur Muslims.Mosques are one of the main targets on which where China spouts its venom against Islam.It demolished an estimated 25 thousand mosques in 1949, and only about 500 mosques were left in this vast territory. Today, China has abandoned half of the communism in its "economy," but it still hunts down any manifestations of religiousness, especially among young people.This has been the actual policy practiced by China in the region. In spite of all that, the vitality of Muslims continued in East Turkistan which enabled the return of the manifestations of Islam to life, especially in the countryside.The unrest which plaged the region continued every now and then, and made it a territory distinguished by instability because of the bombings and acts of violence against the state and the fixed position of seeking secession from China. Consequently, it became the weakest spot of the state from the inside. In response, China watches the details of the lives of Uyghur Muslims, and prevents the media from monitoring the executions and arrests it carries out in the darkness forcibly on the region. 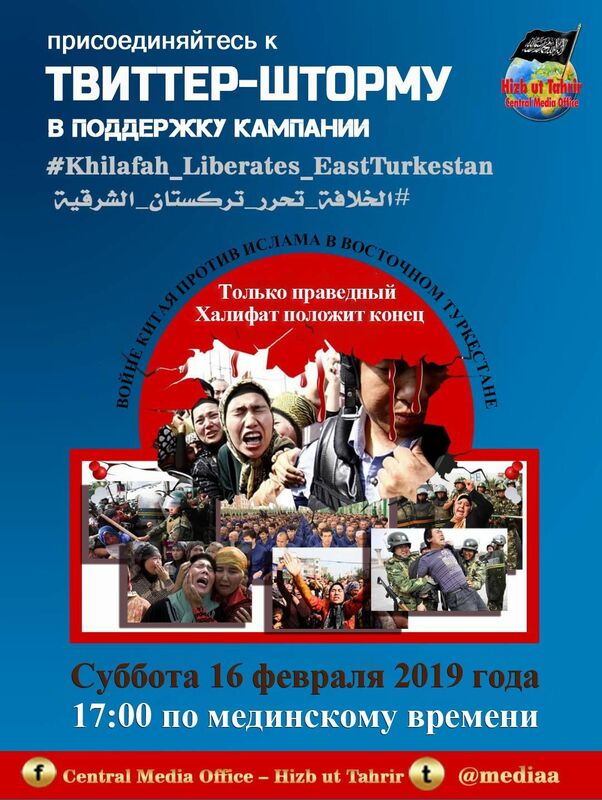 It also tracks down the Uyghur Muslims who fled and have a voice outside, and under the pretext of "terrorism" it has been able to arrest many of them through international security channels, particularly from Central Asia countries and Pakistan. The painful fact is that these Chinese atrocities against the Uyghur Muslims are taking place under the eyes and ears of millions of Muslims in the world without them putting pressure in removing these atrocities.This is because these millions of Muslims are scattered and are not unified together by the state, the state of the Ummah, the state of Islam, the absent righteous Khilafah (Caliphate) that every Muslim who is able must work to bring back, and to find a Khalifah, the imam, who takes care of affairs rightfully and who protects and is a shield from whom behind the Muslims fight, as stated in Sahih Al-Bukhari from Abu Huraira may Allah be pleased with him who said: the Messenger of Allah (saw) said: «وَإِنَّمَا الإِمَامُ جُنَّةٌ يُقَاتَلُ مِنْ وَرَائِهِ وَيُتَّقَى بِهِ» “Verily the Imam is a shield from behind whom you fight and by whom you are protected”.And then China and others will not dare to hurt a Muslim because they will realize that their aggression will be met with double in retaliation. Indeed Allah is strong and powerful. 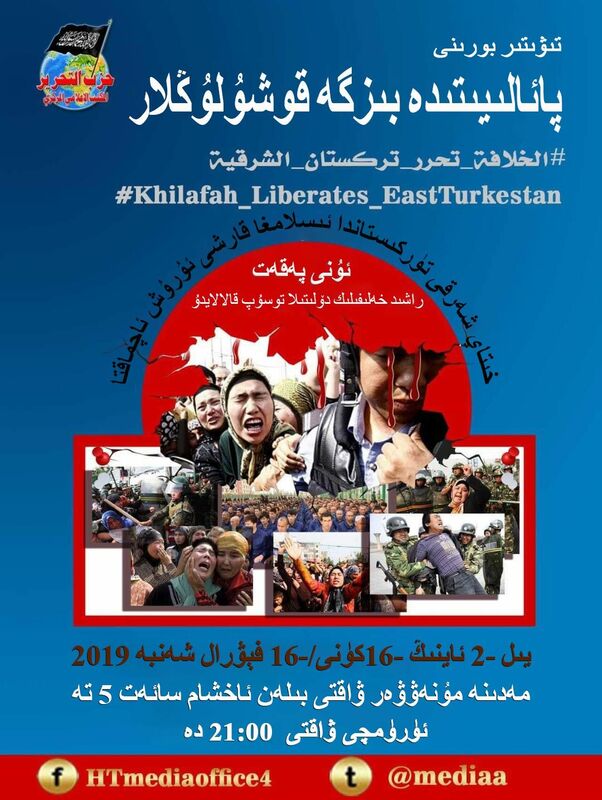 As part of the events in Support for our vulnerable Muslim Uighurs in East Turkistan! “The worst of rulers are those who treat their subjects harshly." How long before the Muslim World says enough?